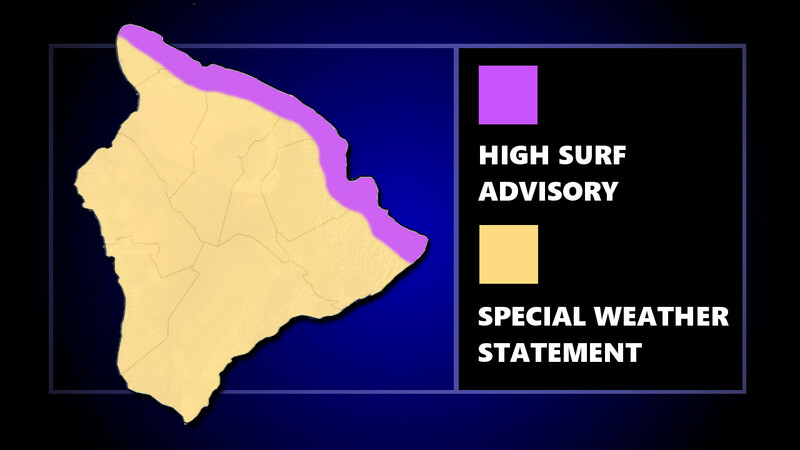 HAWAIʻI ISLAND - A High Surf Advisory is in effect and a Special Weather Statement has been issued for the Big Island. (BIVN) – A High Surf Advisory is in effect for east facing shores of Hawaiʻi until 6 a.m. Friday. The National Weather Service says surf of 5 to 8 feet is expected along exposed east facing shores. Heading into the weekend, wind and surf will pick up. “A much larger west northwest swell expected Friday through Saturday will produce surf well above the High Surf Warning level for exposed north and west facing shores,” forecasters said. In a Special Weather Statement issued for the entire state, the National Weather Service warned of very strong winds and coastal flooding possible this weekend. A potent low pressure system will move toward the islands from the north over the weekend, bringing multiple weather hazards. The low will send a powerful swell toward the islands that will impact exposed north and west facing shores with very high surf. Additionally, the combination of strong onshore winds and high surf will increase the potential for significant coastal flooding that could lead to property damage, road closures and beach erosion. The low will also bring strong and potentially damaging north to northwest winds, beginning late Friday and continuing through the weekend. While these winds are expected to be strongest over ridges and mountaintops, they will also accelerate downslope, impacting heavily populated areas. If you have outdoor plans for the weekend, be prepared for very windy conditions. If your plans include marine activities, you may want to consider postponing them.